The Canon EF 24mm f/2.8 IS USM is a capable but pricey ultra wideangle prime that will appeal most to landscape and reportage photographers looking for a lightweight and responsive lens. Despite it's lack of an L-series billing, the Canon EF 24mm f/2.8 IS USM build quality is reassuringly good and it makes a good partner to a full-frame Canon DSLR like the 5D Mark III. Auto-focusing is quiet and quick, with the ability to manually override it and focus manually if required proving a nice touch. The capable image stabilisation system used in conjunction with a high-ISO monster like the 5D Mark III is a low-light shooter's dream ticket, making it easy to hand-hold the camera and get the shot. Image quality is generally excellent. Chromatic aberrations are very well controlled, geometric distortion is impressively low for an ultrawide lens (unless you are focusing very close), and the Super Spectra coatings successfully prevent contrast loss attributable to flare, The only real optical issues are obvious corner shading at the maximum aperture, something that every full-frame shooter has to put up with, especially when using wide angles, and a lack of edge sharpness from f/2.8-5.6. 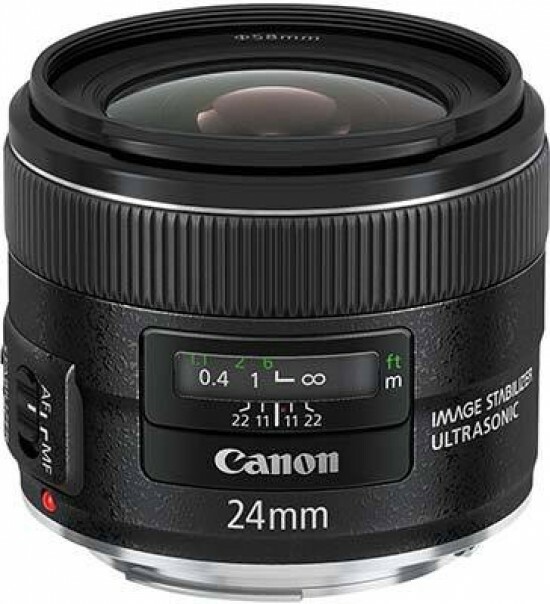 If you can afford the rather hefty price-tag and don't mind the non-L billing or sharpness fall-off at the edges of the frame, we can recommend the Canon EF 24mm f/2.8 IS USM as a great ultra-wide prime lens for Canon full-frame DSLR owners.